You want something you can make uniquely yours and our cheap glass coaster set fits the bill when you do your inserts in the photo display area. 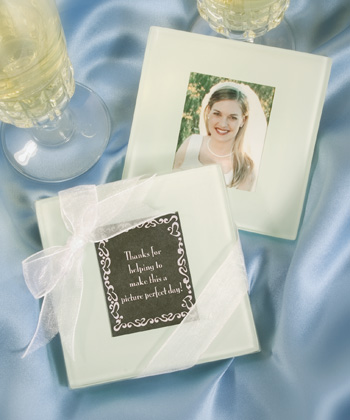 Whether you use a birthday photo, engagement photo, scripture for religious events or just creating a one of a kind place setting for your holiday tables, you and your guests will use them again and again! Each is packaged in a set of two and measures 3.5" square with a 2"H x 1.75"W photo insert area that will arrive with a preprinted note that says, "Thanks for helping to make this a picture perfect day!" 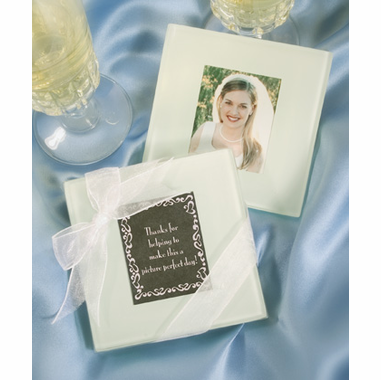 The set of two coasters comes in a transparent box finished with a white organza ribbon.